In the 2010 R1 release, Intersoft introduces a new ASP .NET collection control under the WebEssentials suite. Further information about WebEssentials can be found here. One of the controls in the WebEssentials is WebExpander. In this post, I will show you how to mashup Google Maps service with WebExpander to display contact list address. The following screenshot illustrates the above scenario. You can achieve the above scenario by customizing the WebExpander’s Mode and Flow property, and use custom inline template for the WebExpander’s header and content section. You also need to implement WebExpander’s OnClick client side event to call the Google Maps service. I have provided a working sample which you can download at the end of this post. Now, let’s start customizing the WebExpander. Customize the Mode property I’m going to set the Mode property to Fixed. Customize the Flow property I’m going to set the Flow property to Right because I want the Google Maps service to expand to the right of the header. Customize WebExpander’s header and content section As you can see from the above screenshot, there are two sections in the WebExpander. The list of contacts and the Google map address of the selected contact. The list of contacts is the header section and the Google map is the content section. The following code shows the customization of the header and content section using custom template. 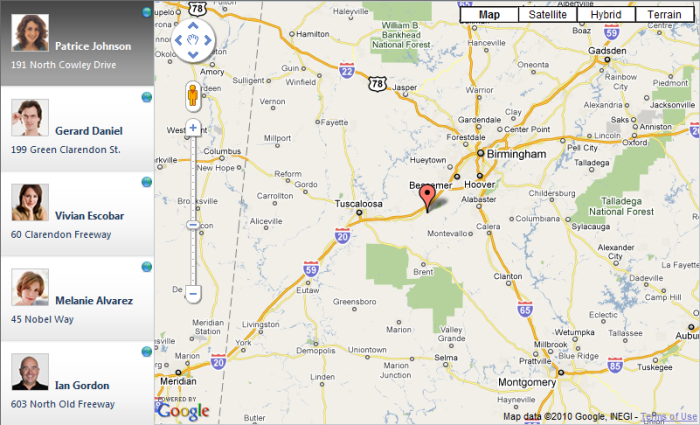 The content section is set using a predefined size to hold the Google Maps service. OnClick client side event The Google Maps service API is called in the WebExpander’s OnClick event handler. In order to get the correct map size, you should ensure that the content section is fully expanded before calling the Google Maps API.